Adams Carpet Care has been providing quality commercial carpet cleaning in Raleigh, Durham, Chapel Hill and Cary for the past 28 years. Business owners, like home owners, expect the very best service for the price. Our carpet, upholstery, area and oriental rugs and tile & grout cleaning services are professionally done using biodegradable cleaning products that won’t harm customers or employees. 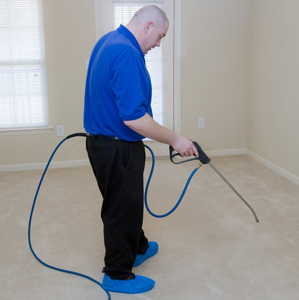 We use a truck-mounted steam extraction system to reach deep into the carpet and material to remove stains and dirt. We are licensed, insured and carry Worker’s Compensation Insurance so you can rest assured that you have professional commercial carpet cleaning company on the job. As part of our customer-focused approach, we provide free, on-site inspections for each commercial carpet cleaning job to assess the scope of work and provide a detailed written proposal. We want you to understand the exact cost and scope of our services so you can make an informed decision without any surprises. We provide evening and weekend appointments because we know that time during the work-week can sometimes be hard to find. Adams Carpet Care offers cleaning services to apartment and other Property Management Firms. We know it’s important that your tenants move in to a clean and healthy environment. Let our cleaning services make this part of it easy! If you are in need of commercial carpet cleaning or property management services in the Raleigh, Durham, Chapel Hill or Cary areas, please give us a call or email today. We accept Cash, Checks, MasterCard, Visa & Discover credit cards.